Because who doesn’t love brownies? In this post, Little House Living blogger Merissa Alink shares one of her favorite family recipes from her childhood in the prairies of the Midwest. 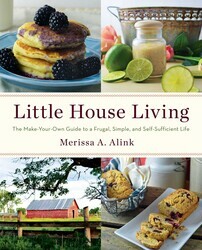 Don’t miss more wonderful comfort food recipes, and Merissa’s trademark DIY concoctions for everything in your house and home, in her book Little House Living, out October 20th. When I was growing up I used to love making desserts for my family. I would check cookbooks out from the library then only go through the dessert section of the book and place several bookmarks by the recipes that I just had to try. It not only became something that I loved to do but something of a family tradition. Usually at family get-togethers the adults made and brought the food but I started to become the go-to person that they asked to bring the desserts. I even started making my family all of our holiday desserts…Christmas cookies, Thanksgiving Pumpkin Pie, Easter Cakes…you name it! Can’t you just picture it in your mind? Instead of going to the mall and doing other things that normal teenagers do…there I was in the kitchen, my grandma’s old apron on, flour all over the place (I’ve never been a “clean baker”), and sweet smells coming from the oven. Oh well…it’s not like it had any influence on my future or anything. 🙂 Wait…. Brownies were always a favorite because they could be quickly made when you just needed something chocolate. This recipe is fudgy, cakey, and perfectly chocolatey…all of the things you need in a brownie. It also has very simple ingredients that you probably already have on hand. In a bowl, mix together the dry ingredients (the flour, sugar, cocoa powder, baking powder, and salt). Add in the water, oil, and vanilla extract and mix well until all ingredients are blended and no lumps of dry ingredients remain. Pour the batter into a greased 8×8 baking dish. Bake in the oven at 350 degrees for 20 minutes or until a toothpick inserted into the center of the brownies comes out clean. And don’t miss your chance to win a homemade gift bundle and a copy of Little House Living, enter today!